I’ve recently been researching multi band antennas. My first thought was to remove the balun from my 40m dipole, feed with ladder line from an external auto-ATU and treat as a doublet. However, in several auto ATU manuals one antenna kept being mentioned: the loop (often a delta loop). Many documents refer to dimension calculations for a single band of operation. Others state dimensions but are vague about how these calculation are made whilst also referring to use over multiple bands. I couldn’t find much regarding feeding of random loops. In a spare 30 minutes I thought I’d string up the largest loop I could fit in the garden. What’s the worse that could happen? The resultant loop was approximately 70m in length and strung up in a horizontal sloping rectangle, loop ends entering the upstairs shack window and fed directly from an old KW ATU using balanced outputs. The wire used was very thin, solid core ‘bell wire’; far from ideal for an antenna. The ATU tuned most bands but on TX I noticed a brief arc on a speech peak. I had a 4:1 balun I’d previously made for another project so placed this between the ATU and loop. The loop then presented a much easier load and tuned without issue on every band I tried (80m to 10m). On RX, comparing the loop and 40m resonant dipole, a 2 S point (~6dB) difference was observed in favour of the dipole. However, in summary, surprisingly good performance for a loop made of unsuitable wire and thrown up with no thought for dimensions. More investigation and experimentation definitely required! 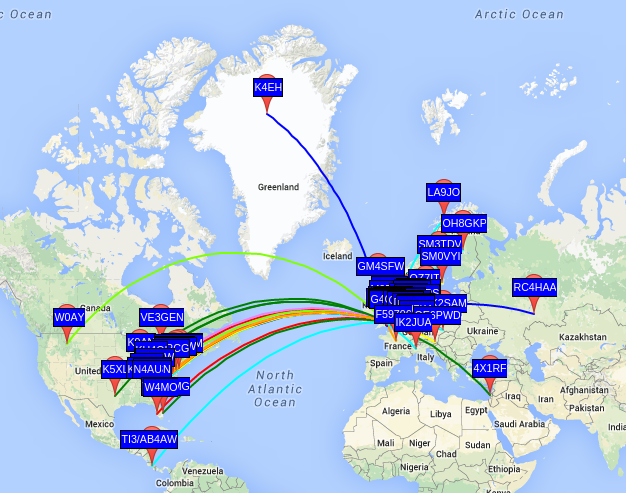 This entry was posted in Uncategorized and tagged antenna, loop, random, wire, wspr. Bookmark the permalink. I’d be interested to see what you make of your further investigation into this. What’s the next step? WSPR is a low power automated data mode. Periodically a beacon message is transmitted that contains coordinates, callsign and power level used. Other stations receive this and automatically upload details to wsprnet.org, where results are available either in the form of a database or map. When my PC isn’t TXing, it’s receiving other station beacons and doing likewise. It’s a great tool for testing antennas and/or propagation as the whole thing is automated. See http://wsprnet.org/drupal/wsprnet/map for a live map (you can change band, filter callsigns etc). The loop has now been taken down but the result has encouraged me to investigate a more permanent option. I don’t think I’ll be losing the 40m dipole any time soon though as the performance is superb; I do wonder if a multi-band antenna is always going to be a compromise! I have to say that the idea of a permanent option is something I’m looking forward to. It’s coincidental that you’ve posted this today because this weekend just gone I have been thinking a lot about multi-band options for antennas as well. Obviously I’ll have some way to go before it becomes a necessity but I love the idea that different configurations provide different results. I think you’re right, though – a multi-band antenna probably is going to be a compromise!